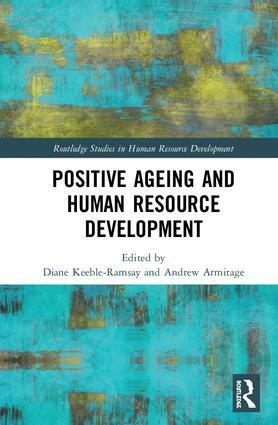 Positive Ageing and Human Resource Development seeks to introduce readers to some of the major cultural issues that the current demographic changes of the workforce as the national default retirement age within the UK has moved from 60 to 67 and beyond represent for the workplace. This phenomenon is happening in other economies. It recognises there are social shifts in terms of the psychological contract and expectations of different sets of workers. Rather than seeking to extend ideas around multi-generational research eg millennials and generation X/Y, it provides some contributions and commentary which may inform employers, HR professionals and those interested in Human Resource Development (HRD) when considering how to plan for these challenges. It considers the concerns that HRD thinking has largely been focussed upon the development of leaders or managing people, rather than how such sociological shifts may impact upon the nature of work and subsequent productivity. It recognises that many companies have failed to plan their people management strategies and talent management approaches to cope with this shift largely given their uncertainty how to address. It takes a set of contributions then, which focus upon different issues broadly based around age, in order to provide illustrations of some of the areas for discourse of the lived experiences of those affected by the probability of working into their late 60s or potentially even late 70s. Much of this is focussed around women’s working lives as the impact of later working represents a number of peculiar issues around the valuing of women’s work and its contributions. Dr Diane Keeble-Ramsay is Deputy Director of Positive Ageing Research Institute (PARI) at Anglia Ruskin University, U.K.
Dr. Andrew Armitage is a Fellow of the Higher Education Academy and lectures in Management Development and Research Methods at Lord Ashcroft International Business School at Anglia Ruskin University, U.K.